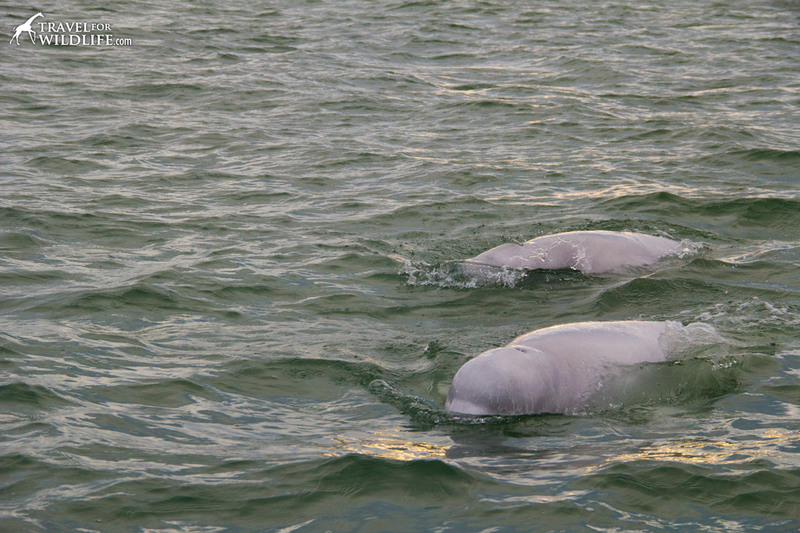 If you asked me what my favorite wildlife encounter was, I would have no doubt: swimming with belugas in the wild. 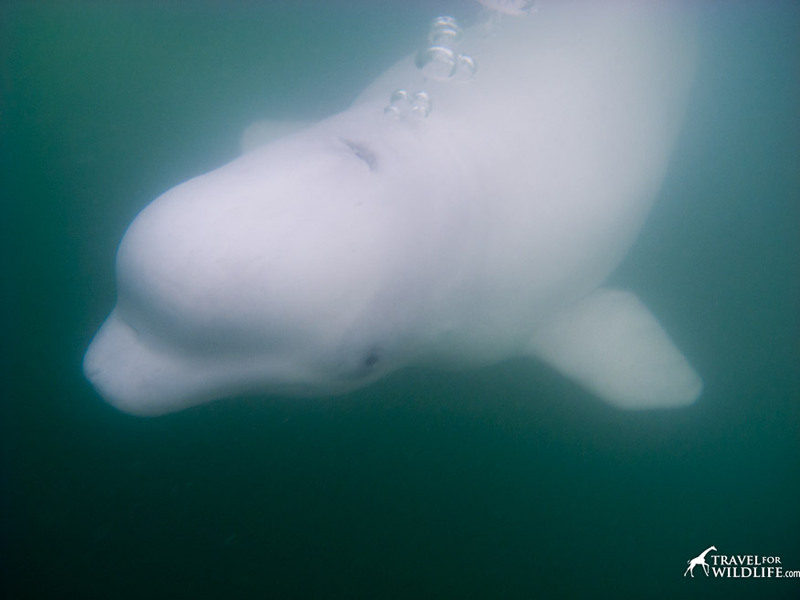 Important update: In 2018, the Department of Fisheries & Oceans in Canada deemed that snorkeling/swimming with beluga whales is detrimental to them and has implemented a new policy stating that operators cannot get within 50 meters of a whale. This change will be in effect for the 2019 season and beyond. Therefore swimming with belugas is no longer possible anywhere in Canada. 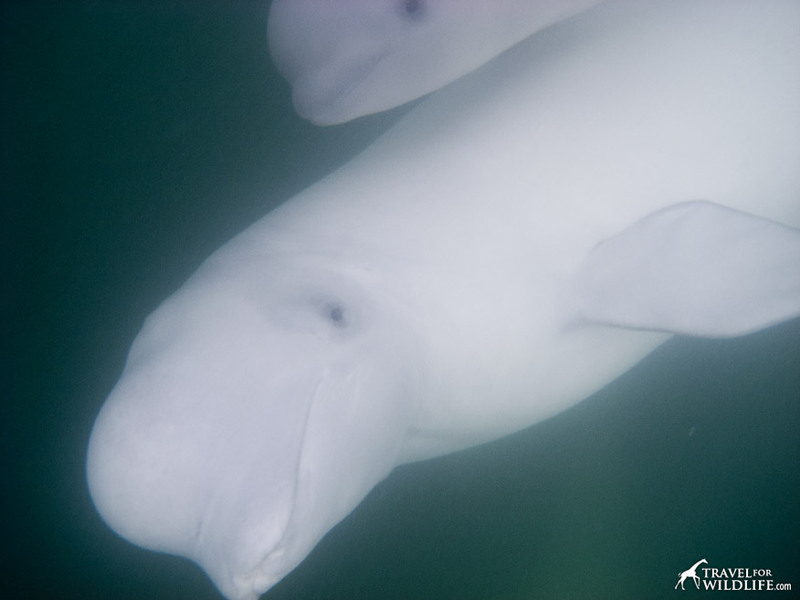 You can still go on zodiac tours to see belugas with the same tour operators that used to run the swim with beluga tours. 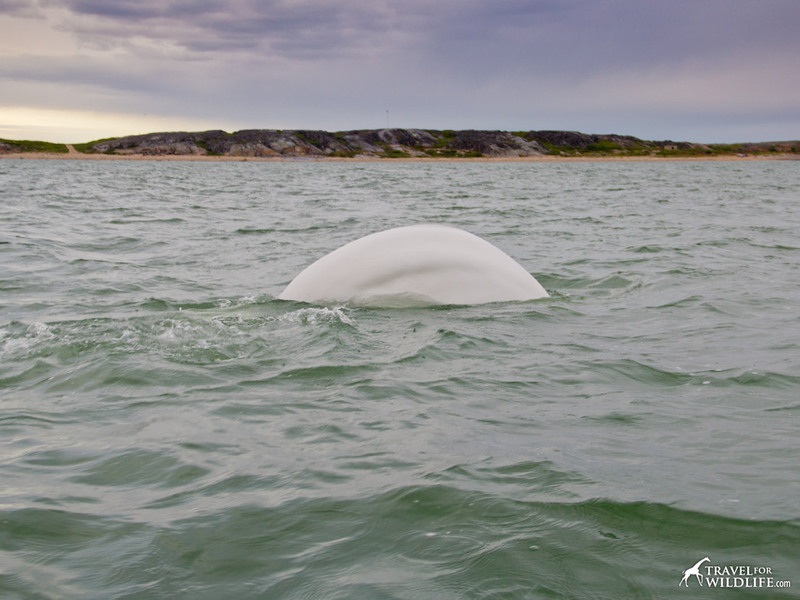 When we arrived in Churchill I thought that swimming with belugas would be like swimming with wild dolphins. Don’t get me wrong, wild dolphins are just awesome and swimming with them is a magical experience, but belugas are a wee bit different. Dolphins have a very strong presence, almost intimidating. I somehow felt more connected to belugas, more intimate. Perhaps it is because they can turn their heads to look at you with flexible necks, or because they can move their lips as if they are smiling, and even change the shape of the “melon” on their forehead. Perhaps most of all it is the fact that they are always “talking”, chattering and chirping and squealing, that I felt I could communicate with them and them with me. To me, belugas are magical. 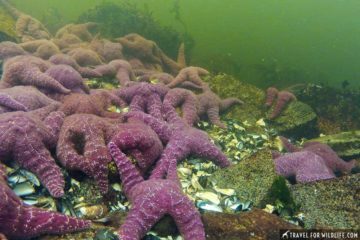 They loom out of the murky green waters of the Churchill River, glowing pure and white, and swim straight at you singing all the while. They bring their little gray babies (they turn white with age) so they can also take a look at you. They stare at you so closely that at first you might feel the urge to back away. I once had to close my eyes when a beluga was only inches from my face. Belugas don’t understand about personal space. Yes, they do get this close! When I got out of the water I couldn’t speak. I was so moved by the whole experience that I cried. 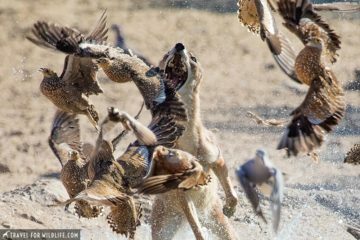 (It was the first time I ever cried after a wildlife encounter). 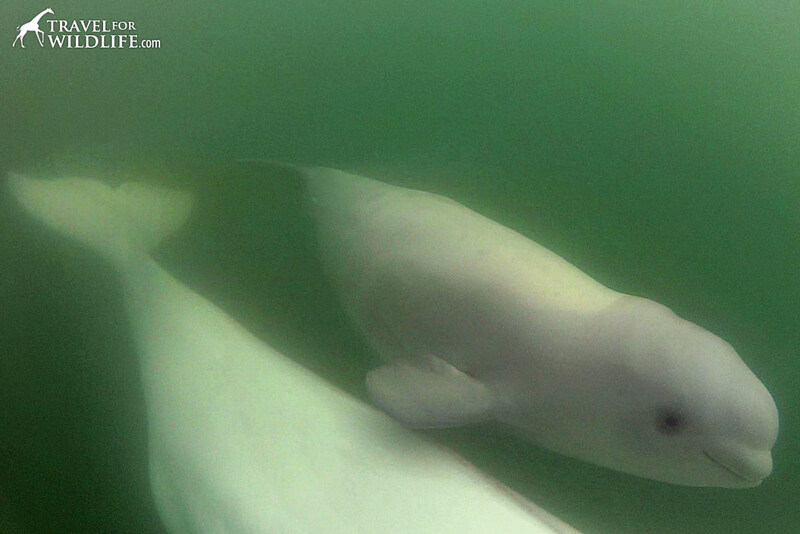 When you go swimming with them you’ll understand why I call them the Angels of Hudson Bay. And that’s what I want you to do. 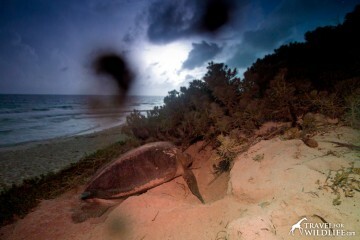 I want you to plan one of the best wildlife experiences you’ll ever have. Even if you have to save for a couple of years. It is definitely worth it. Just watch the video we took during this experience! Now that you are all excited, it is time for planning! Here is everything you need to know to swim with belugas in the wild. 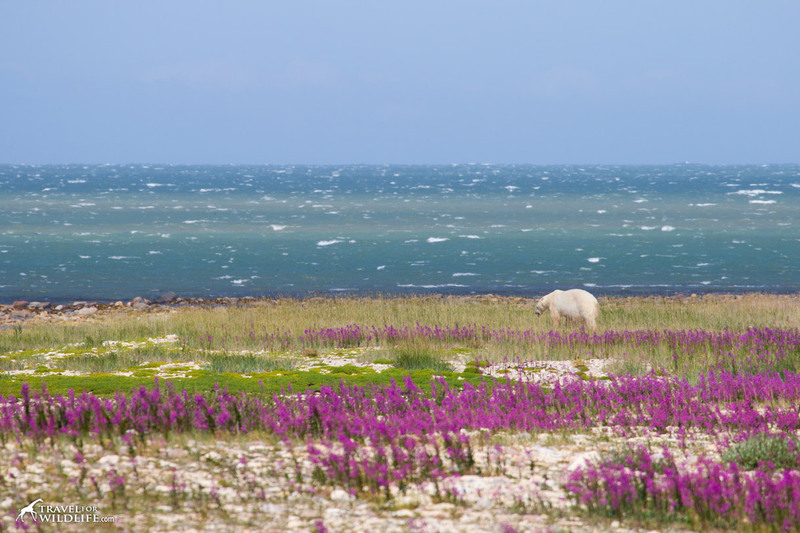 Join the Birds, Bears and Belugas tour with Churchill Wild. Book the tour, sit back, and relax. No need to plan anything. The Seal River Lodge is remote and only accessible by plane from Churchill so you’ll be totally immersed in polar bear country. You can read the article we wrote about this tour here. 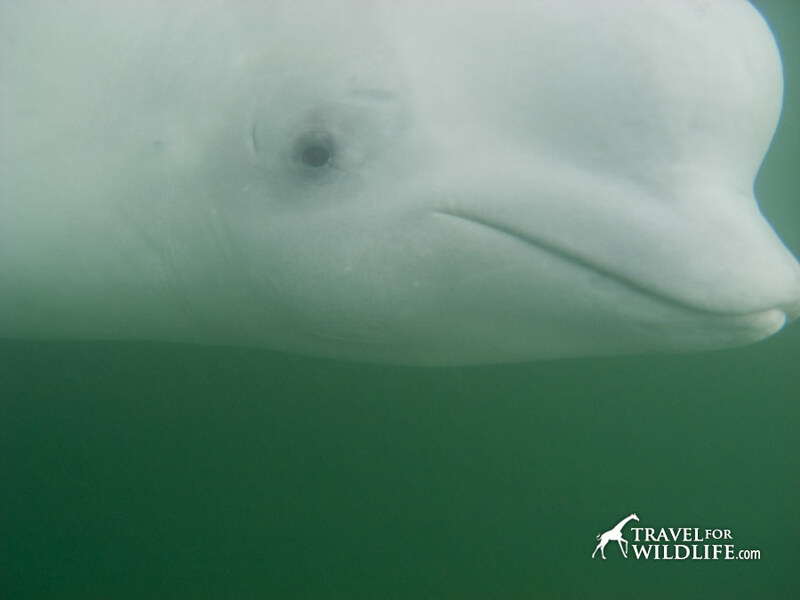 Travel to Churchill independently and go on a Snorkel with Belugas Tour with Sea North Tours. The purpose of this article is to help you plan your independent beluga whale experience. Beluga whale season is summer, primarily July and August. You may be able to see belugas in June depending on when the ice melts each year. Check the tour times page at Sea North to get a better idea of available dates. Sea North Tours is the only provider of tours to see the belugas in the town of Churchill. That’s easy! You don’t have to decide which tour provider you should choose. 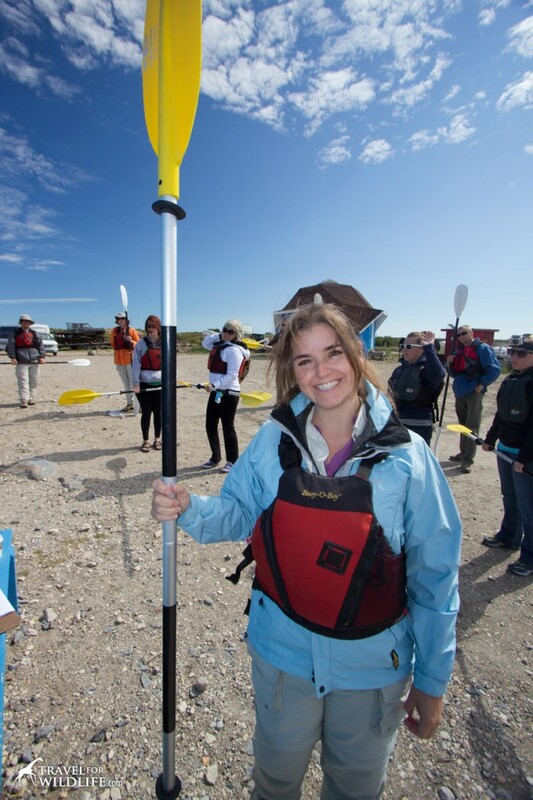 Getting ready to kayak with beluga whales! The trip departure times change daily, it all depends on the tide. So check with them when they are going out. Some days they go out at 7am, some days at 11am, some days at 2pm and some days there is no snorkeling with belugas. You can see their outings calendar on their website. Make sure you plan your visit accordingly. This is very important! : Ask your guide to drag you behind the zodiac! Belugas love this! They can’t help their natural inquisitive nature when they see snorkelers being pulled slowly by a boat. But here’s the trick, you have to face backwards. That way, belugas can follow you face to face. It’s awesome! Here’s how to drag backwards behind a zodiac. If you’re lucky, your guide will have a rope on board that they will tie off to the back of the zodiac. When you enter the water with your wetsuit and snorkel gear on, grab the very end of the rope and wrap it loosely around your fist for a secure grab. Then maneuver your body along the rope and wrap one of your legs around the rope with one half wrap. Ta daa! You’ll drag backwards! Hold the rope close to your chest to avoid getting tired. This leaves a free hand to film with your GoPro. We talked with some people who went on other zodiacs and they were disappointed. Their zodiacs just stopped and let them snorkel aimlessly around the zodiac. They didn’t see many belugas and the ones they saw weren’t very close. If you are being pulled, belugas will follow you and stay with you much longer! Bring a warm fleece and a hat on the zodiac. 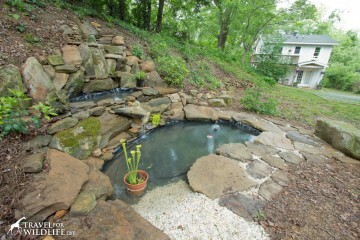 You will need it for when you take a break from the cold water. The zodiac crew will have warm drinks for you. Make sure you are aware of any signs of hypothermia. Shivering, slow and shallow breathing, memory loss, drowsiness… If you have any of these, let your guide know. Take a break. If you have your own dry suit and can fit it in your luggage, you might want to bring it. (Be sure to check weight limitations for flights to Churchill!) Sea North Tours will provide you with a 7mm wet suit (14mm over the torso), which should be fine. I definitely was cold (it was a VERY cold day), but didn’t really care as all I wanted to do was to hang out with the belugas. Sing to them! Belugas are very vocal and love to communicate. Someone told me that if I sang to them, they would answer. So I did. And they replied! They really like high pitch noises, so I sang the Dexter theme song. And they loved it! Give it a try. •GoPro Dive Filter for Standard Housing (RED) . The waters in the Churchill River can be very murky and your video might appear green (what happened to us). Even though the red filter is only for when you go diving and normally you won’t need it during snorkeling, we recommend taking one in case you need it. As you can see, some of the photos we got are pretty green. 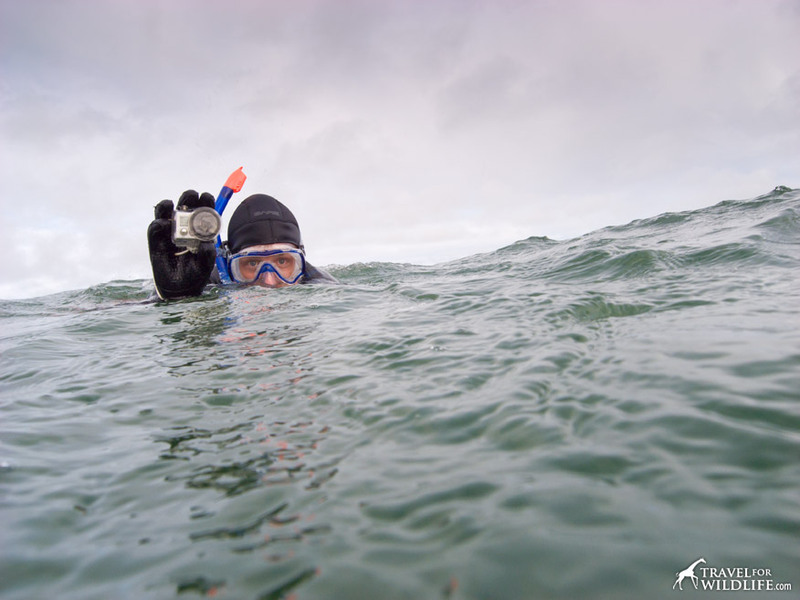 •Bobber – Floating Hand Grip for GoPro® HERO Cameras : This GoPro accessorize by GoPole doubles as a hand grip for your GoPro and a flotation device. Because you don’t want to lose your GoPro, right? Also, a GoPro is a great option for filming when you’re kayaking. 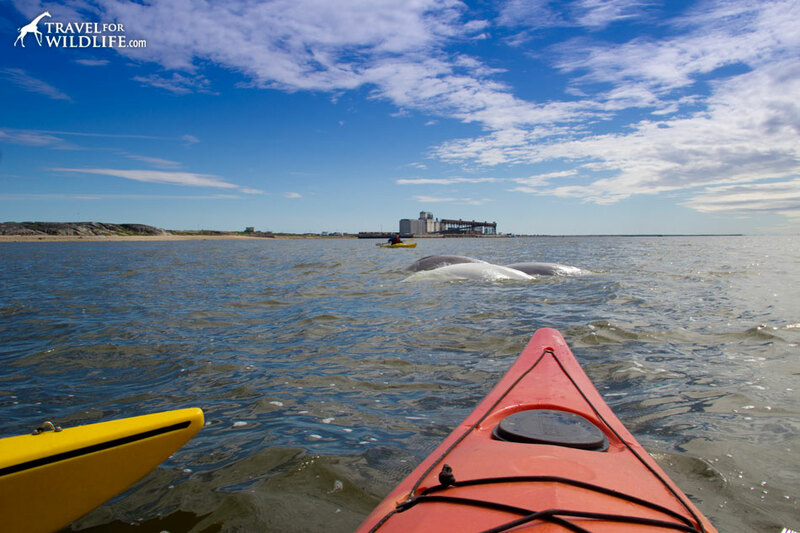 Check out this cool close encounter with a beluga that Hal had while kayaking. So, the belugas are in Churchill, but how do I get there? If you look at a map and search for Churchill, it seems like its in the middle of nowhere. It kind of is, actually. Lucky for you, we wrote a whole post about getting to Churchill. We explore various modes of transportation, from plane to car & train. You choose. How Long Should I Stay in Churchill? If you really want to swim with beluga whales in Churchill, you can’t just visit for a couple of days. The weather changes constantly and it is possible the tour outings will be cancelled because of it. 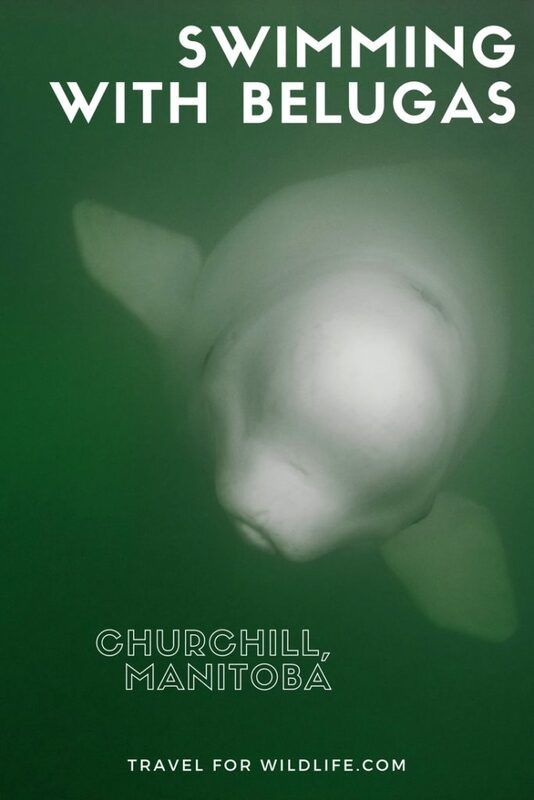 After traveling all the way to Churchill, you want to make sure you get to be out in the water with belugas, so do yourself a favor and stay in Churchill for at least 5 days. Because you never know. When we were there, the outings were cancelled twice. And there are plenty of things to do in Churchill! 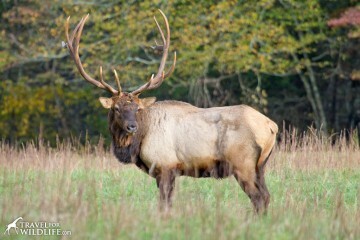 Join a Nature 1st tour. 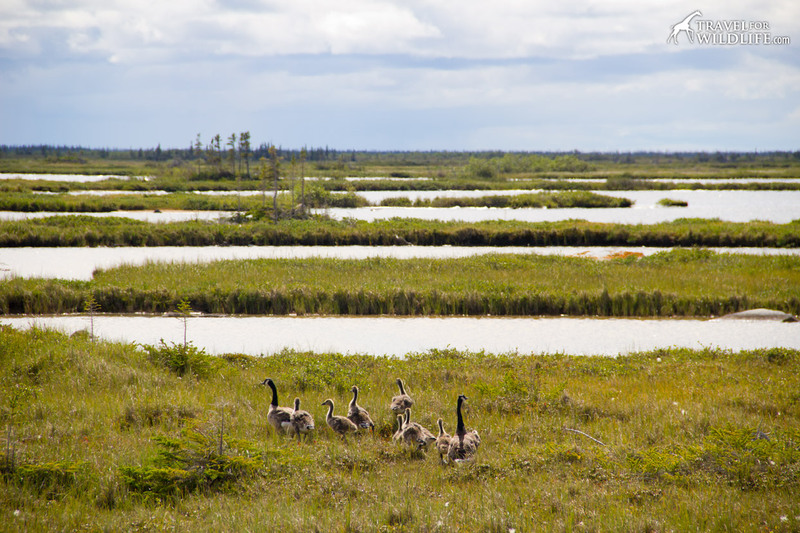 Learn about the birds of the region, the rich history of the area, and explore the different ecosystems found around Churchill: taiga, boreal forest, marine, and tundra. Visit the Churchill Northern Studies Centre. The Center is an independent, non-profit research and education facility located 23 km east of Churchill. Ask a member of staff about taking a Green Building Tour. 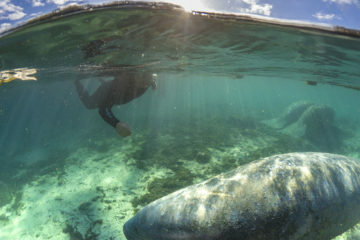 They offer a number of unique learning vacations, from polar bear ecology to Aurora & Astronomy, and learning about the belugas. Kayak with beluga whales. It is a different experience from swimming with them, but since you’ve traveled all the way to Churchill, you can’t say no. Bring your underwater camera and a pole, you can get fantastic beluga whale footage as they are super curious. One of them enjoyed rubbing her/his melon (head) on our GoPro. Have a delicious breakfast at Gypsy’s Bakery & Restaurant. 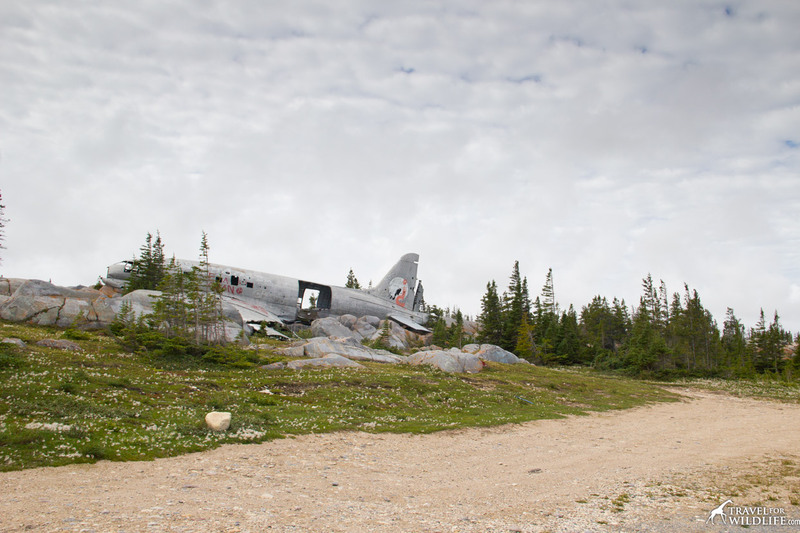 Visit the Miss Piggy Plane wreck just outside Churchill (need a car to get to it). We couldn’t get too close as when we were about to get out of the car we realized there was a polar bear sleeping next to it! So we had to leave. Visit the Prince of Wales Fort. You’ll need to join a Sea North Tours Beluga and Fort Tour. 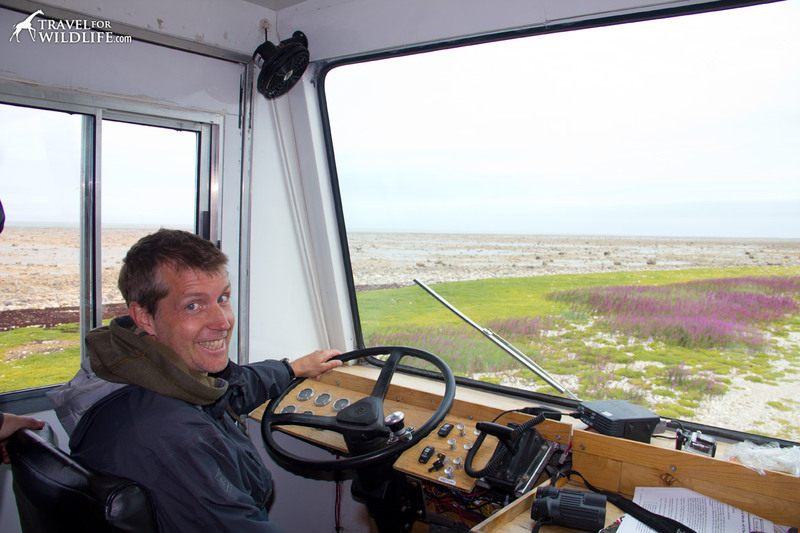 It involves taking a zodiac, so you’ll also get to see the beluga whales again! Churchill is known for polar bears in the fall. That’s because bears gather at the shore of the Hudson Bay to wait for the ice to freeze up again. But bears are on shore all summer once the bay ice has melted So, YES, you can definitely see polar bears in Churchill during summer. But you have to search a little harder for them. 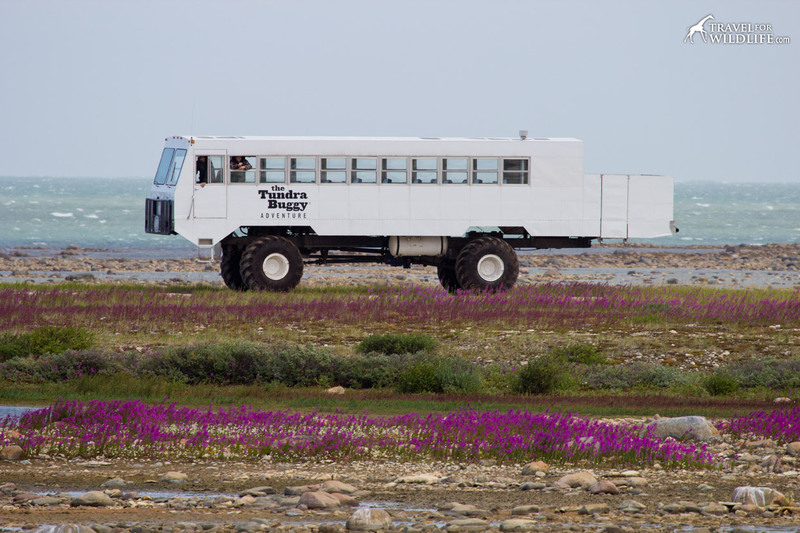 Go on a polar bear tour with Tundra Buggy Adventure Day Tour. 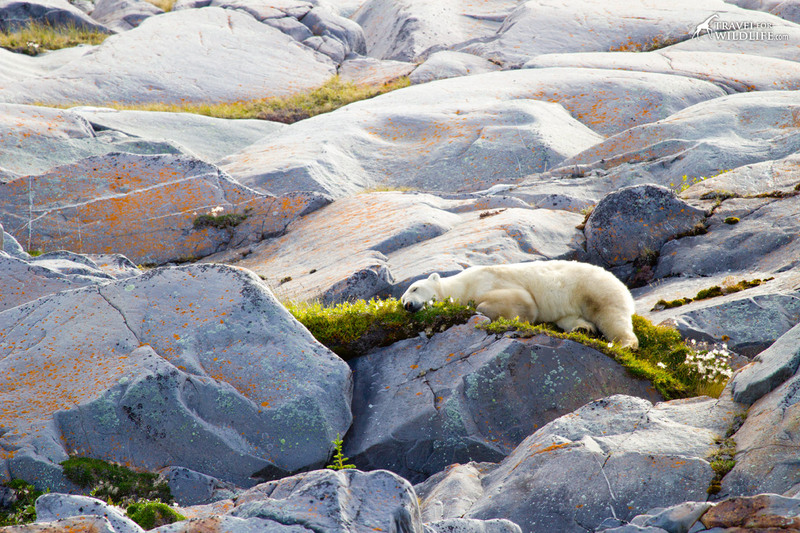 This 6-hour tour by Frontiers North is the best way to see polar bears in Churchill. It is safe, fun, and you’ll get to learn about this sub-arctic habitat and the wildlife that lives here. I hope you get the delicious soup they gave us for lunch when we did it. You can either book these tours in advance or visit the office and try your luck catching a seat while you’re there. If you are lucky, they’ll let you drive the Tundra Buggy for a while! 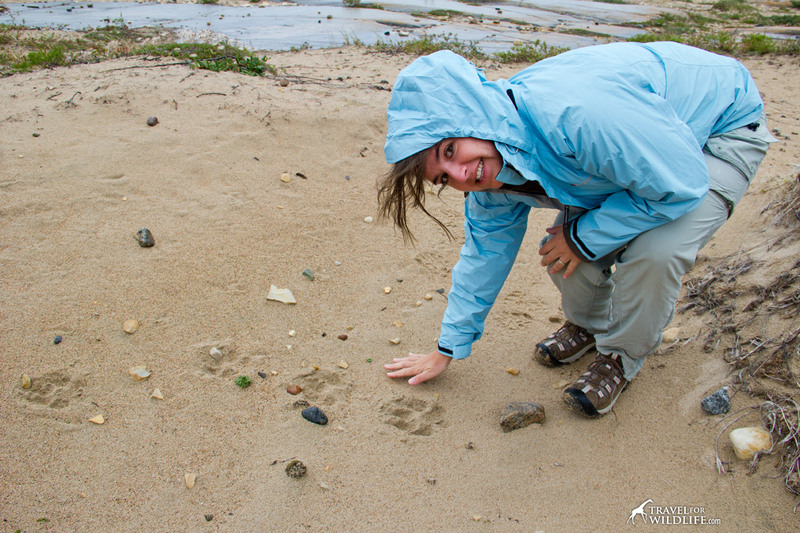 We actually spotted five different polar bears (see photos here) during our single Tundra Buggy tour in the summer! You can also rent a truck from Tamarack car rentals. There is a small network of roads around Churchill where you can drive around. ALWAYS look twice before stepping out of your car. Polar bears can hide pretty well when they are laying around. 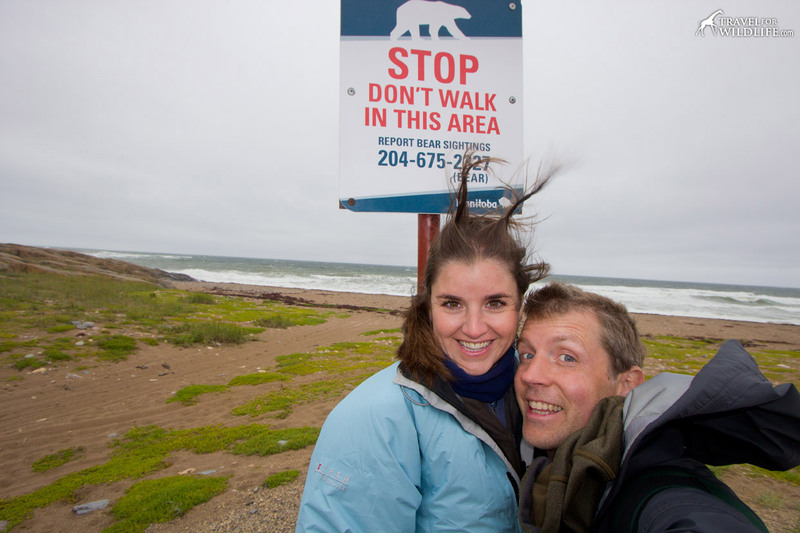 And do NOT approach a polar bear to get a better photo, or even worse, a wildlife selfie. It is a pretty dumb thing to do and you’ll be automatically entered into the Darwin Awards. Be sure to read our article How To Photograph a Polar Bear: an Inside Tip for more info about self driving and photographing bears, and also check out our video How To See Polar Bears in the Summer. Even though Churchill is pretty small, there are a few places that offer accommodation. On our most recent visit, we stayed at the Tundra Inn. 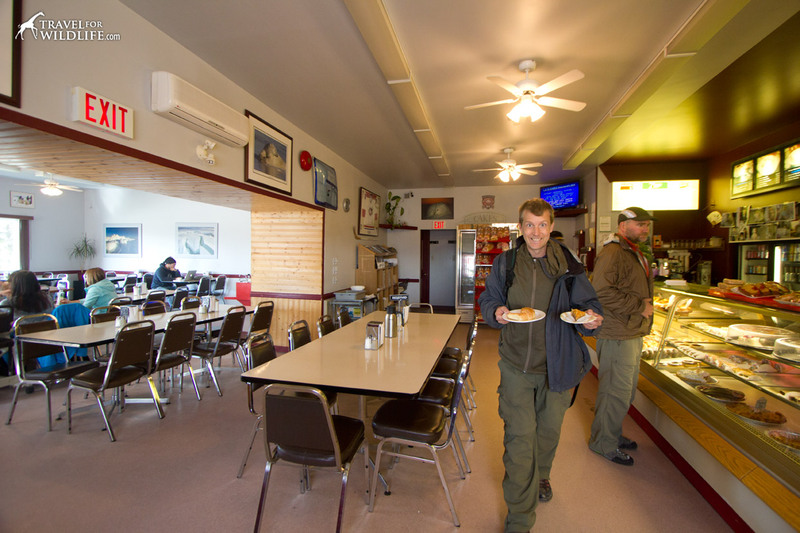 The location is perfect, around the corner from the Churchill supermarket, and the Sea North office (where the beluga trips leave from). 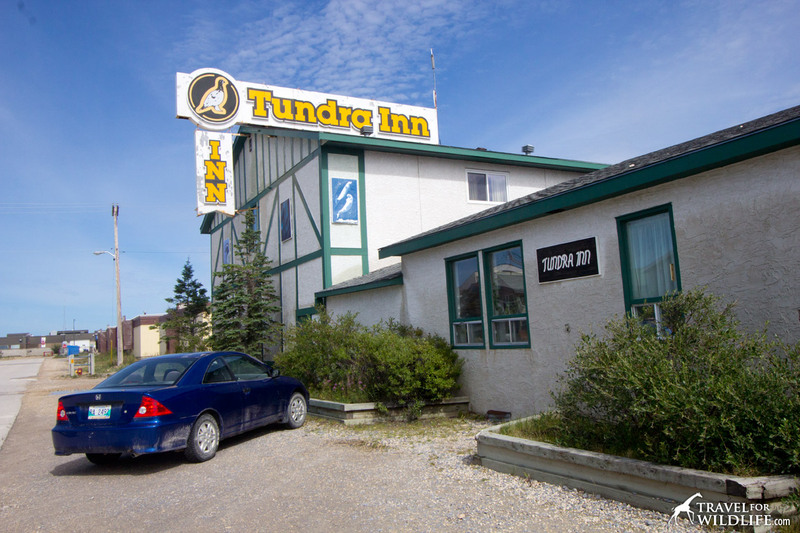 The Tundra Buggy trips start from the Tundra Inn, and the hotel is right in front of the Tundra Inn Dinning Room & Pub (eat poutine!). Believe me, you don’t want to walk more than two steps when the Arctic wind blows! The rooms at the Tundra Inn are very comfortable. There’s even a small area in the hotel where you can use a fridge and a microwave, for the nights you don’t feel like going to the pub for a meal. But you totally should! What to Wear in Churchill During Summer? It might be summer, but that doesn’t mean that it’s warm! We heard that the sea ice didn’t melt until the 18th of June this year. So, ya, it’s chilly. Bring windproof clothing, water proof jacket, a warm fleece, and a hat. You can bring a couple of short sleeve t-shirts, just in case the weather goes crazy and it’s actually warm. But you know what? You won’t care if it’s cold. Swimming with belugas is such an incredible experience that you would do it even in freezing temperatures with icebergs floating next to you. It is the BEST. So get out there and do it! Did I tell you it might be windy and cold? Let us know about your beluga whale experiences in the comments below! Disclaimer: some of the links above are affiliate. If you buy anything through those we get a small percentage at no cost to the reader. This post is amazing. First, I didn’t even know you could swim with beluga whales, so thank you for adding another item to my bucket list! Also, thanks for providing such thorough information, this is a really great little guide! It is absolutely fantastic. I hope I can get to do it again sometime. Thanks so much for all the great information! My wife and I will be going to Churchill this summer for our 20th wedding anniversary and snorkeling/photographing Belugas is definitely at the top of our list. I really appreciate the “getting dragged” tip and “how to see Polar Bears in the summer” tips. Amazing!! So happy I stumbled on this article. Great information – especially the bit about dragging behind the zodiac! I never would have thought of that on my own. What an incredible experience. I’m pretty sure I would have been crying, too! I almost did just watching the video. They are so beautiful!